Package arriving in bad weather -- best procedure? Posted: Tue Apr 08, 2014 12:41 am Post subject: Package arriving in bad weather -- best procedure? I just received the UPS confirmation that my bees arrive tomorrow -- yay! Just in time for the tail end of a nasty spring storm and a brief cool spell -- not so yay. It will get down to the low 40s (F) at night, not get above 70 F on Wednesday, then warm a bit to a normal spring of low 80s during the day and high 50s at night. Bee Weaver Apiaries suggests placing the (opened) package into the TBH and waiting 48 hours before removing the cage. However, if it's going to be cool, and there are no combs to cluster around, should I leave the queen in her cage, among the bees in the package, who I assume would just as soon huddle for warmth in the cage where they can cluster? It seems a bit cruel to hang her cage when there is nothing but a bit of comb around her (a chunk added to create the smell of home) and no way for bees to cluster about and keep her warm. I'm feeling shy of simply letting her out of the cage, especially given the weather, though I've read that's what Michael Bush (and some on this site, too) advise. I felt so ready a few days ago, and now I'm completely unnerved! The weather is adding to it, but maybe the cool and rain will make the bees want to set up shop rather than leave (the queen is clipped and marked, so she will not be flying anywhere). Swarms -- yes, how silly of me! Amazing how two years of reading can just slip out of one's head as the reality of experience hits . Follow the instructions and don't forget to feed them! Feeding is important with a packages as they are not like a swarm, all full of honey and primed for comb building. They have to be helped. As it turned out, the storm grounded the package in Louisiana over night. They arrived this morning, to a beautiful blue sky and somewhat cooler temps then normal, but still fine weather (63 F, down to the mid 40s tonight, but back up to 70s tomorrow and continuing to warm up over the weekend, no rain expected again until next week). UPS was gracious enough to call me as soon as they got in, and allowed me to come pick them up right away rather than waiting another 10 hours. So, I gave my students "in class homework", took my husband to the airport, and picked up my bees. Once home, I read the directions again (after having done so 6 times in the last 48 hours) and managed to only mess up one thing: I didn't have a spray bottle in the house (note to self: do not rely on memory for essentials!). I instead used paper towel dipped in sugar water and ran it over the cage. They seemed quite pleased with this, and the buzzing quieted somewhat. Getting the feeder can and queen out without letting out bees was, umm, impossible. There are probably 3 dozen bees flying around the hive now, not able to enter because I have the entrance blocked. This was recommended by the apiary with TBHs -- put wire mesh over the entrance, get queen cage hung properly (pretty sure I failed on that, but she is there, candy side down, screen facing hive), place food inside the hive, place open package directly in the hive body (it just fit! ), then close everything up and leave them alone for a day or two. 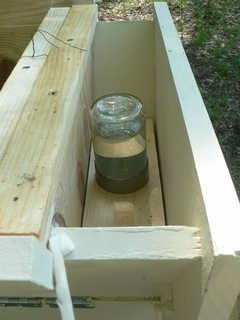 The feeder is inside the hive, accessible through the follower board, and I also placed a small dish of white sugar and small dish of water, too, on the floor of the feeding chamber. 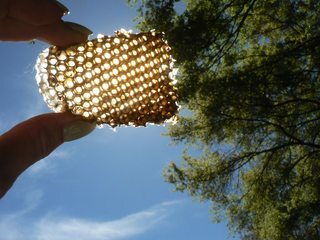 The piece of brood comb I bought from Goldstar Honeybee was of immediate interest, and the bees on the queen cage who weren't trying to drive me off found the comb quickly and began inspecting it. I got "stung" 3 times, though none penetrated the gloves. I took a quick picture of the package in the hive though glare makes it a less than ideal shot. Whew! I am pleased that I stayed calm despite my pounding heart, and can now sit peacefully with a cup of herbal tea before heading back to work! Interesting they said to block the entrance. With the queen locked up they are not going anywhere. I never block the entrances of my hives as I believe they need to be able to get out and orientate and do their little bee business. I believe it has to do with TBHs and the absconding issue, particularly if it's a brand new, never been used hive. I am planning on the 24 hour route, given that it seemed the queen already had attendants looking after her, and I agree they need to get out and fly. When I get home this afternoon, while it is still warm, I'll suit up, remove the package box, open the entrance, and hope for the best! As it turned out, closing off the entrance was a non-issue since my immature hive-making skills left a small hole at the top near the feeding station. When I checked the hive yesterday to remove the box, there were lots of bees buzzing about. The feeding jar was empty, and I think I'll need to incorporate something bigger, like a one gallon ziploc bag. There were also lots of bees in the upper area of the feeding station, which is not ideal, but hey, that's where the hole was! 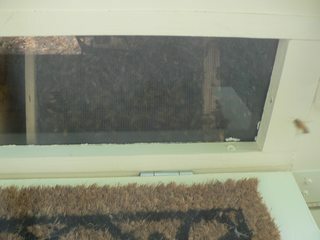 I removed the entrance hole cover, so I guess the bees will make up their own mind about where to enter and exit. The package box was removed without incident...in fact, all in all, the bees seemed not overly concerned about my presence. My daughter and friends noticed bees on the little daisy flowers while walking home from the school bus. She was quite excited, and decided they were "my mom's bees" !